Frontiers in Clinical Drug Research - Anti-Cancer Agents should prove to be a valuable resource for pharmaceutical scientists and postgraduate students seeking updated and critical information for developing clinical trials and devising research plans in the field. In chapter 1, Schwendener and Mete review the key interactions between tumor cells and surrounding mesenchymal and immune cells in the TME and discuss how they can promote tumor progression due to the interaction between tumor cells and immune cells in Tumor Microenvironment (TME). The review emphasizes the therapies targeted towards tumor-associated macrophages. Moreover, the recent developments towards therapies aiming at the cellular and molecular components of the TME are also discussed. Robak and Robak in Chapter 2 focus on recent advances in the treatment of hematologic malignancies by using a nucleoside purine analog, Cladribine (2-CdA). They summarize the current status of 2-CdA in the treatment of hematologic malignancies. Targeting telomerase may be an attractive therapeutic approach for treating hematologic malignancies due to the association of telomere shortening and telomerase activation with the diagnosis of various hematologic tumors. In chapter 3, Kawauchi et al. review the mechanisms of telomere and telomerase regulation in hematologic malignancies with several strategies of telomerase Inhibition and other therapeutic methods. Lung cancer is one of the leading causes of the cancer death worldwide. The treatment of non-small Cell lung cancer (NSCLC) requires an individualized approach due to its heterogeneity. In chapter 4, Vera Hirsh describes the role of EGFR tyrosine kinase inhibitors (EGFRTKIs) for the treatment of non-small cell lung cancer (NSCLC) in patients with epidermal growth factor receptor (EGFR) mutations. Pediatric tumors offer unique challenges as compared to their adult counterparts. Arnaldez and Warren in chapter 5 review the key signaling pathways implicated in their tumorigenesis and recent efforts to target them. In chapter 6, Fu et al. provide a comprehensive overview of anti-tumor natural products in drug discovery and clinical applications. This review describes the role of plant-derived natural products, animal extracts & medical anti-tumor minerals as anti-tumor natural products. 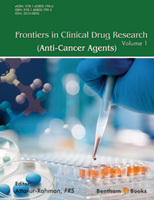 It is hoped that the readers will find these reviews valuable and thought provoking so that they trigger further research in the quest for the pharmaceutical development of anti-cancer agents. I am grateful for the timely efforts made by the editorial personnel, especially Mr. Mahmood Alam (Director Publications) and Mr. Shehzad Naqvi (Senior Manager Publications) at Bentham Science Publishers.